Good to know you can lean back and relax, even on bad roads. 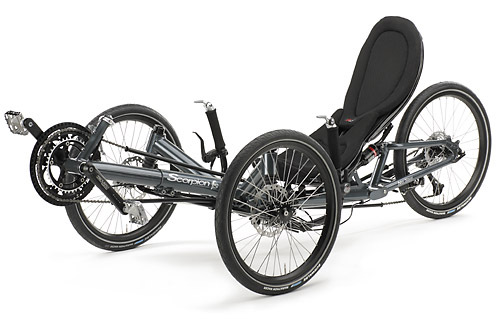 With the new, foldable touring-trike Scorpion fs our engineers combined a full suspension chassis technique derived from modern automotive technology with the award-winning design of our Scorpion trikes. The low seatposition and a significantly higher bottom bracket emphasize the sportive attitude of this agile ride. You can feel the results of this masterpiece of finest German engineering immediately when cutting the first corner: a synthesis of perfect roadholding and a maximum of “Fahrvergnügen”. 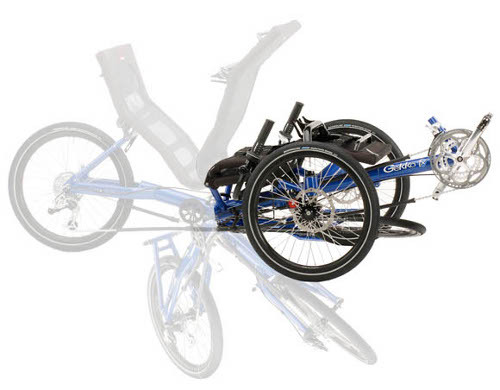 Long wheelbase, straight lines, easy rolling 20″ wheels and integrated independent suspension – the dynamic appearance of the Scorpion fs leaves a long lasting impression. 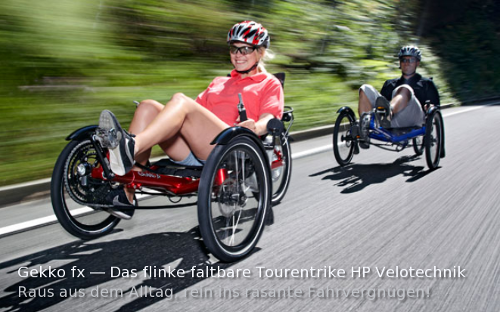 This conveniently foldable touring trike has been designed by HP Velotechnik’s engineers especially with the needs of commuters and touring cyclists in mind. The seat height of the Scorpion fx is noticeably higher and more upright compared to its more sporty fellow Scorpion, offering great outlook and a good view in traffic. The higher seat also allows for an additional lowrider rack behind the seat. Its solid design allows for a safe transport of a pair of front panniers. Together with the robust rear rack, you can thus transport up to 50 kg of luggage in four panniers. 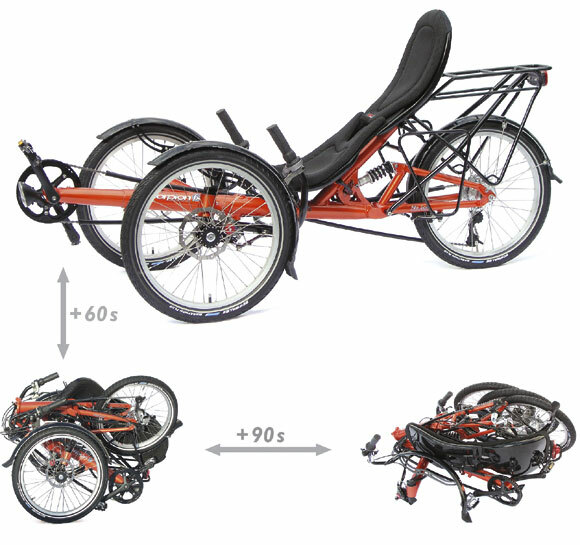 For a stable ride, all racks are positioned close to your body and your trike’s center of gravity. Once you are loaded that high, you’ll value our optional 81 speed gear system that will give you your extra low gear when pedaling the really steep challenges. Handy package. Just a few steps convert your fast touring trike into a handy package that can be easily transported in the trunk of your car. It takes only 60 seconds to remove the seat without tools and fold the rear frame forward just like the tail of a Scorpion. You’ll find a little strap hiding behind the frame that connects the folded frame parts so that you can carry your trike around. If you require an even more compact package, you can remove the front wheels in 90 seconds with a simple allen key – now your Scorpion fx can even fit in a small micro car like the Smart.